A Charlotte is a versatile desert, you can make one out of stale bread, biscuits, sponge cake, cookies, even bread crumbs. Just layer it in a mold with a fruit purée, custard cream, whipped cream, citrus curd ,etc.., they will all be called a Charlotte. “Charlotte Russe” was invented by a French chef in England during Georgian Era, sometime in the 1800′s in honor of the British king’s daughter Charlotte and a Russian tzar Alexander I. 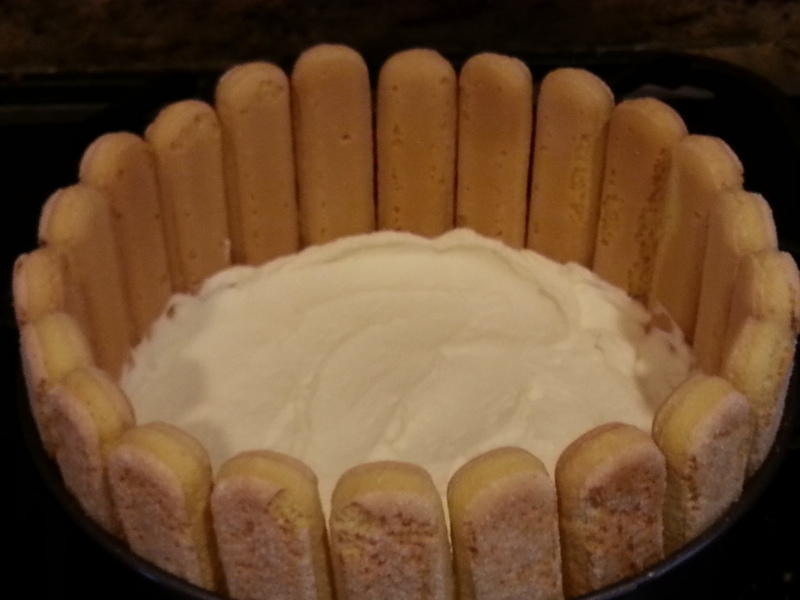 It consisted of layers of ladyfingers and Bavarian crème. There is also a “Charlotte Royale” made out of cut up layers of jam filled jelly rolls and crème. People of Russian/Soviet descent make a type of Charlotte called “Charlotka”. It’s basically a sponge cake with fruit baked in s a layer, similar to the upside down cake. This year we celebrated Father’s day a day earlier. My mom invited us all to her house for a late lunch(that slowly turned into dinner). I never planned to make this particular desert for Father’s Day, in fact I didn’t plan to make any dessert at all. It was just on a whim that I bought a huge package of “Savoiadrdi” cookies/Ladyfingers, while shopping for my new obsessive sushi making. I had about an hour and a half to kill, before getting ready to leave to my parents house, and thought I’ll make a quick ” Charlotka”. 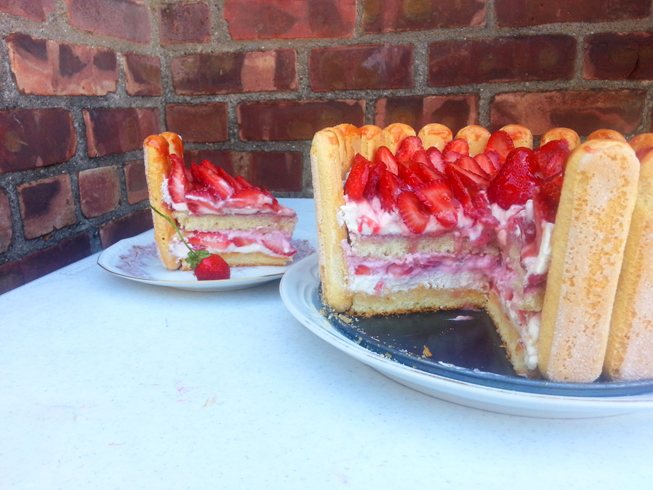 When I started – I didn’t think I would write a blog post about it, but once I forgot to add fruit to the sponge cake dough – I got inspired to make a layer cake, and then thought a” Charlotte Russe” was much prettier than a layer cake. So here comes my version, with lemon scented sponge-cake soaked in apricot jam & cognac syrup (I just can’t stay away from this stuff when cooking lately), Greek Yogurt, whipped cream and lots of strawberries. Preheat oven to 350F. Grease and flour your cake pan. Add batter to the cake pan, place in a middle rack in the oven and bake for about 30 -40 minutes, or until a toothpick inserted into the middle of the cake comes out clean. 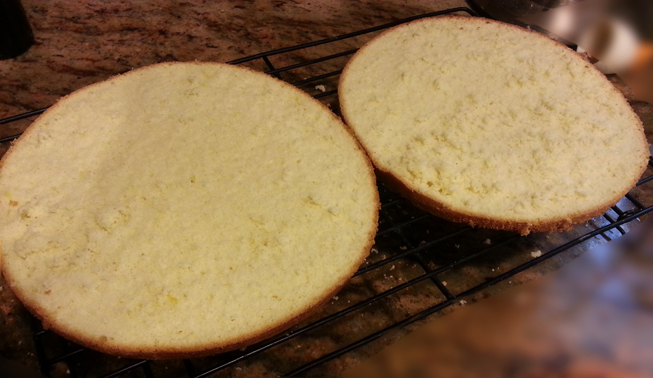 Run a thin knife around the cake invert it on a cooling rack or plate and let cool. Level the top of the cake by cutting of the bump horizontally. Boil strained raspberries and 2 tablespoons sugar in a sauce pan. Add Package of Jello and whisk, quickly add mixture to greek yogurt, and cool. Whip heavy cream with the stabilizer and powdered sugar and a couple of drops of lemon juice , until peaks form. Mix cognac with preserves and 1/2 cup water, boil and strain to remove apricot pulp. Spongecake layers should fit into a spring form pan in such a way, so that you could fit a layer of ladyfingers vertically. If it’s to tight – cut the spongecake layers to fit. Pour the apricot preserve evenly over the two cake layers. Add a layer of cake into the spring form pan. Surround it with ladyfingers. Add half of the whipped cream mixture. Cover with a layer of strawberries. Add the Greek yogurt. Cover with a second cake layer. Cover with the rest of whipped cream, and decorate with the rest of the strawberries. Refrigerate for 2 hours. Just before serving, glaze the strawberries with heated, strained and cooled jelly and alcohol mixture. Remove the cake from the mold unto a platter and Bon Appetit ! This cake is soo beautiful and seems easy and lots of fun to make, I can just see how my daughters will love helping me out. Larisa, you are the best. btw, I walways wanted to learn to make “sharlotka”, but never go to it. Thank for your recipy with a piece of history! You are amazing! 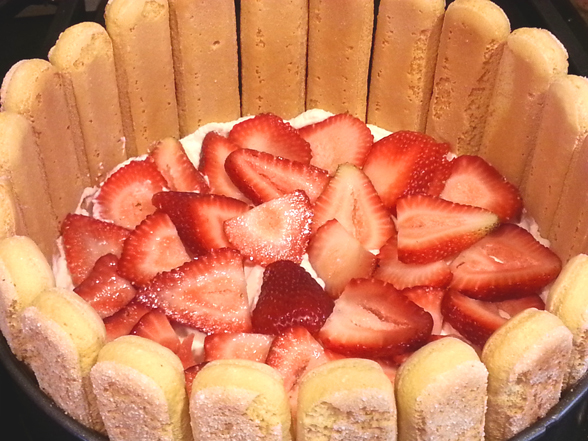 It is easy, its an icebox cake essentially, perfect for the summer.